It's now been a month since I published my last post. So you guys might be wondering what was I up to. Well, I apologize for not being active on my blog. I had apologized for it on twitter. Sorry for the inactivity, We will start posting regularly from Nov 15th InshaAllah. And had informed that I was designing a blogger template and I even asked for suggestions. Working on a new template. Not sure wether to give it away for download or use it on my blog. So I keep my word and today I give you a Responsive and Minimal Blogger Template Jabeen - The very first Blogger Template designed by ABT. Jabeen is a minimal blogger template designed by ABT. A fully functional dynamic Blogger theme. 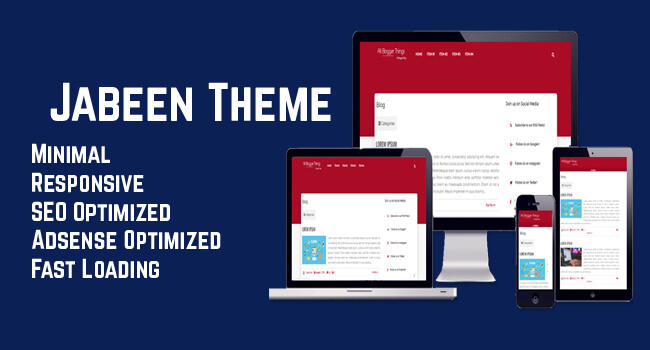 It is user-friendly, SEO friendly, Responsive Blogger Template. So if you have been looking for a fast and responsive blogger template, then you are in the right place. Now, let's take a detailed look at its features. Jabeen has multiple features. We discuss them one by one. Jabeen is an SEO friendly theme and is created by keeping the SEO aspect in mind as it is essential for any website. So we have included all the SEO plugins and Meta Tags in it. So you do not need to worry about SEO at all. From the title tag to the description to the author tag all of them are present. Jabeen is fully responsive. Today most of the people browse on their mobile rather than their Laptops or Desktop PC's. So most of your user that arrive at your website would be using mobile. If your website is not responsive, they will find difficulties in using your site, and they will leave your website. So you would start losing users. But for your convenience, we have made Jabeen fully responsive. It passes the Google Mobile-Friendly Test. You can check the responsiveness of the theme by visiting Responsinator. Jabeen is unlike other templates on the internet is fast loading. So you would definitely love it. It has a Google Page Speed Score of 99. Yes, 99!! The Template uses Font Awesome and Google Fonts, and there is less use of images, so it helps reduce load time. The Font Awesome script is already installed so you can easily use Icons in Blog Posts or Widgets. Jabeen is Adsense ready and contains warm ad spot at the top. Ads can also be added in the sidebar and in posts. Keeping your blog readers in mind, we have optimized the text of the theme. And the template contains navigational menus, search boxes at appropriate places. The size of the font is optimum so that your readers are able to read comfortably. Even to this date some people IE. Different people use different browsers. So keeping that in mind we have made Jabeen fully compatible. It works well in all the browsers. Jabeen is packed with a bunch of widgets which include the two navigational menus, sidebar social widget, email subscription widget present below the post, related post widget, numbered page navigation widget, and social sharing widget present below the post. It is my first template, and it took me a month to design it. So I want you to co-operate with me. If you're going to download this template, then please subscribe to our newsletter and then comment the email address with which you have subscribed below. And you will receive the theme via email. Update: You no longer need to subscribe to our newsletter to download the theme. Just click on the link below to download the theme. You need to update some links and other things to fully set up the template. Download PDF file from the link below and follow the instructions as given in the file. This template is created by All Blogger Things. The theme contains a credit link. Please do not remove the link or we will take action against you. This template is licensed under a Creative Commons Attribution-NonCommercial NoDerivatives 4.0 International License. You are not allowed to reproduce it without permission. Jabeen has everything you need for your blog. It is minimal, fast loading, responsive, SEO optimized, Adsense Ready and is packed with features. It took me a month to design this template. So I need your help in making it a success. If you liked the theme, then please share it with your friends. If you face any problem during installation, then let us know in the comments below. Thanks!